If you suffer with earaches regularly or you have young children who seem especially prone, check out the post below from ‘Common Sense Homesteading’ which details 12 home remedies to help cure earache and reduce pain. Personally when at home I use one of those microwaveable wheat bags and place it on my ear, I find the heat soothes the pain. You could also try a hot water bottle. The thing is about cold sores (also known as Herpes Labialis & Fever Blisters), unless you suffer with them, you have no idea how painful, irritating and embarrassing they can be, but the really annoying thing is that once you are infected with the Herpes Labialis virus, it never really goes away and you will continue to get cold sores over and over throughout your life. I was going to say that it’s a great idea for preppers and homesteaders to grow Wooly Lamb’s Ear in case the SHTF, but I actually think that it’s a great idea for everyone to grow some as a natural alternative to store brought Band-Aids etc. Get some planted and you’ll soon have all the natural Band-Aids you need! Preserving food by fermenting it is about as low-tech and simple as it gets, but the health benefits of fermented food are great. It could even be argued that many fermented foods are actually healthier than when they were raw. The main reasons being that fermented foods digest far quicker and they are more easily absorbed by your body. This is because the fermentation process has already naturally started breaking the food down for you. Additionally the bacteria which cause the food to ferment give your immune system a huge boost, in a similar way to natural yoghurt. Check out the post below to find out more about why you should consider including some fermented foods in your diet. As with most essential oils, you get what you pay for – oil of oregano and good quality oils don’t come cheap, so don’t be tempted by cheap oils. The good news is that whilst a 1oz bottle will set you back around $15, a little goes a long way, and that bottle should last you ages. 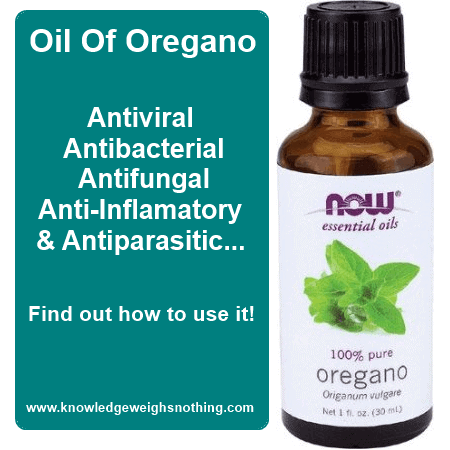 Check out the link below to find out how to use oil of oregano to treat a whole range of conditions. Please also note the cautions at the bottom too. If you want to purchase some oil of oregano, we have never been let down by NOW Essential Oils, so check out their Oil Of Oregano on Amazon. Millions of people worldwide have either type 1 or type 2 diabetes, which in most cases is controlled with diet and medications. Many diabetics, especially those who are into prepping and emergency preparedness, are rightly concerned about how they would cope without access to insulin and other medications. Below is a post written by Dr. Bones (aka Joe Alton, M.D from Doom And Bloom) all about disaster preparedness for diabetics. Actually it is more than just a post, it is part of a series of posts about diabetes in survival situations. There is even a very interesting post about how to make insulin, which could be very relevant, post SHTF. If you or a family member are diabetic, I recommend reading the whole series of posts. One of the great things about using herbs to heal is that they are usually purchased prepared and ready to be used in foods. All you have to do is figure out the correct dosage and then consume the required amount. If the home remedy says take one teaspoon of turmeric a day, that’s all there is to it as in most cases it is the herb itself which is the remedy. Some remedies call for a combination of herbs, but even then it is usually just a case of mixing the required herbs. If you want to stock up on the best healing herbs, check out the post below which lists the top 10 herbs used for home remedies. To find out even more about the healing powers of herbs, I recommend The Healing Herbs: The Ultimate Guide To The Curative Power Of Nature’s Medicines. Turmeric is one of the most medically and scientifically studied plants/herbs on the plant, but most of us just know it as one of the main ingredients in Indian curries. As a keen runner I was aware that turmeric has very powerful anti-inflammatory painkilling properties. It is widely used by sports men/women as a natural alternative to taking ibuprofen to reduce inflammation and injuries. Turmeric has also been proven to reduce the pain and inflammation of arthritis… Below is a website that lists 600 studies where turmeric was successfully used to treat a whole manner of health conditions. It makes very interesting reading, and if you suffer from one of the conditions covered, it could be worth doing some research on dosage/preparation and giving turmeric a go.